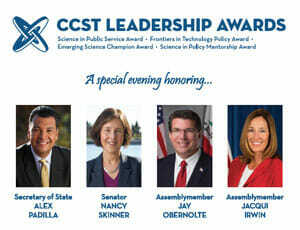 SACRAMENTO, Calif. – The California Council on Science and Technology (CCST), a nonpartisan, nonprofit organization established via the California State Legislature to serve state leaders, is proud to announce the inaugural recipients of its CCST Leadership Awards. The awardees will be recognized during the CCST Science & Technology Week Reception and Leadership Awards Ceremony, Wednesday, February 21, 2018, 5:00 to 8:00 p.m., at Cafeteria 15L in Sacramento. The greater Capitol community is invited to attend; RSVP here. 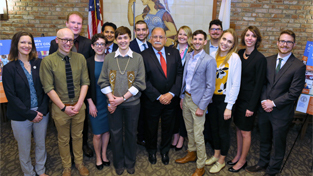 Given to a current or former Legislative Member with training in science or engineering who has gone on to lead a distinguished career in policy and public service, while continuing to incorporate science advice and address science-related policies throughout their leadership roles. Given to a current Legislative Member whose legislative actions are addressing the impact of new technology on Californians, including laws, regulations, higher education, or workforce and economic development. Given to a current Legislative Member whose legislative actions early in their career have consistently considered scientific evidence and advice. 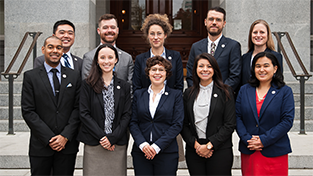 Given to a current or former Legislative Member whose participation and guidance have contributed deeply to the CCST Science & Technology Policy Fellowship program, which recruits and trains PhD scientists and engineers to work as legislative staff in Sacramento.